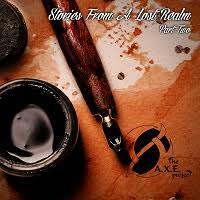 This is the second part of the Stories from a Lost Realm. The first release was in 2010 and I do believe they are planning a third part in a few years to complete the trilogy. This if the second full release from the Goth Metal band from Sofia in Bulgaria. They have been active since 1994 when they were known as simply A.X.E. Let’s just say that Goth Metal was a real big staple in Metal in the end of the nineties and the early 2000s with pioneers like THE SINS OF THY BELOVED and THE GATHERING and more recent bands like LEAVE’S EYES and CULT OF LUNA. Well this band did get a lot of inspiration from these bands but that’s as far as I will go in comparing them! The first song is ‘’Intro’’. It’s an instrumental song that has a very symphonic sound. You can hear blistering winds throughout the intro and this could have been off a Power Metal release to be honest. It was a nice way to begin the album. The second song is "Fear The Angel’’. It begins with a flute solo and you can hear this wonderful instrumental throughout the song. They alternate three different types of vocals. You have the uneven harsh vocals that are horrendous, you have the clean female vocals (she tries to sing Opera but it just doesn’t mesh well with the rest of the song) and the clean male vocal who has zero emotion and no range at all. It’s a traditional Goth Metal but with vocals that make me cringe! The third song is ‘’Sunrise’’. This song reminded more of some of the weaker songs from AYREON. You have a lot of dual cleans vocals at the beginning but there isn’t any synergy between them. They don’t complete themselves at all. The only good things is really nice keyboard and drum solos in this song. It saves the song to be not too totally horrible. The fourth song is "Camelot’’. It begins with a very nice violin solo and some keyboards then the harsh vocals come in. The harsh vocals just don’t fit at all with the mood of the song. The guy can’t sing and it sounds like he is squirming and he is just cranky. If the song would have stayed instrumental, it would be have been much better. In the middle of the song, we have a very nice acoustic guitar solo and that’s the high point of the song. The song finishes with dual vocals like in the previous song and still doesn’t mesh well. The fifth song is "Prisoner’’ and it starts with a pretty nice flute solo and some birds chirping in the background. It’s a mid-tempo ballad and it is definitely the smoothest song of the album. Not too much vocals and the song is a change of pace from the rest and I highly enjoyed the piano solo in the middle of the song. The sixth song is "Ancient Earth Suite’’. This is the longest song of the album, almost as long as the last song on this release actually. Sometimes this song makes me think of Celtic Rock with some traditional Irish Music elements. I always enjoyed the ode to that type of traditional music and I thought it offered something different from the rest of the album. The song seems to be in three parts. It starts off with some clean operatic vocals (still not keen on those and she can’t seem to be able to be get those lower notes as much as the high notes unfortunately), then a very long instrumental suite and it ends on a low note with some clean vocals again. The seventh song is "Frozen Eyes’’. This is the song that strays from the path and it’s more in the style of Symphonic Metal, well much more than Goth Metal. You have less vocals than beforehand but we have an omnipresence of the harsh vocals. There is not emotion in the black metal-esque vocals and it just doesn’t fit over the music. You have a lot of keyboards, guitar solos and when you put those vocals in the background, it overshadows the good elements of the band. The last song of the album is "Highway to Eternity – Outro’’. Probably the best song off of this offering. We have a lot of solos and they give much more time to each member of the band to show what they can offer. You still have horrendous vocals and really awful pronunciation (I know they are from Bulgaria and it would be nice to be able to hear the vocals more clearly but that’s a pet peeve of mine). This song reminded me a lot of the early NIGHTWISH albums. The music is pretty good and the quality of the production is better than most stuff nowadays but the quality of the singers hurt the overall feeling of this album and I don’t really recommend this album to be perfectly honest.